The idea of satellites beaming radio communications around the globe was discussed by science-fiction author Arthur C. Clarke in 1945, though he imagined huge geostationary space stations permanently staffed by astronauts who would be needed to change the electronic valves in the onboard radio transmitters. We’ve not been able to watch live cricket matches from around the globe on television for very long. When I was a child in the UK in the 1960s we would need to wait for days for film of major events in the US to be flown across the Atlantic and shown on TV. After I first arrived in New Zealand in 1982, highlights of British football games played on a Saturday were shown on TV the Sunday afternoon eight days later – unless the tape missed the flights out. The introduction of rapid, voluminous radio links via geostationary satellite has revolutionised TV, and other types of communication. In my preceding blog post I discussed the distinction between geosynchronous satellite orbits, and geostationary orbits. The first geosynchronous satellite (Syncom 2) was launched in 1963; the first true geostationary one (Syncom 3) followed a year later, although long-distance TV broadcasts were first carried by other satellites before these two. It was another decade before TV transmission via satellite became commonplace, with 1976 usually being taken to be the start of the satellite TV age. Some memes take a long time to die out, as one can see from noting that many people still refer to ‘cable TV’ though the cable requirement has long since disappeared. 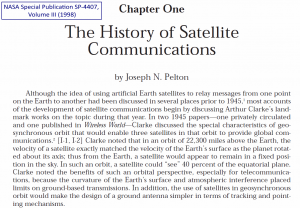 Who invented the concept of using satellites in geostationary orbit for communications? 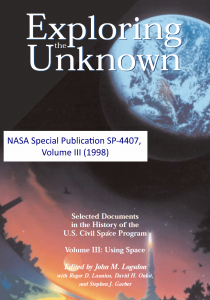 The short-lived Slovenian engineer Herman Potočnik (writing under the name Hermann Noordung) seems to have been the first to suggest the idea, in 1928, although the pioneer Russian rocket theorist Konstantin Tsiolkovsky had earlier noted that at an altitude just below 35,800 km a satellite’s angular speed would match against that of the Earth below. 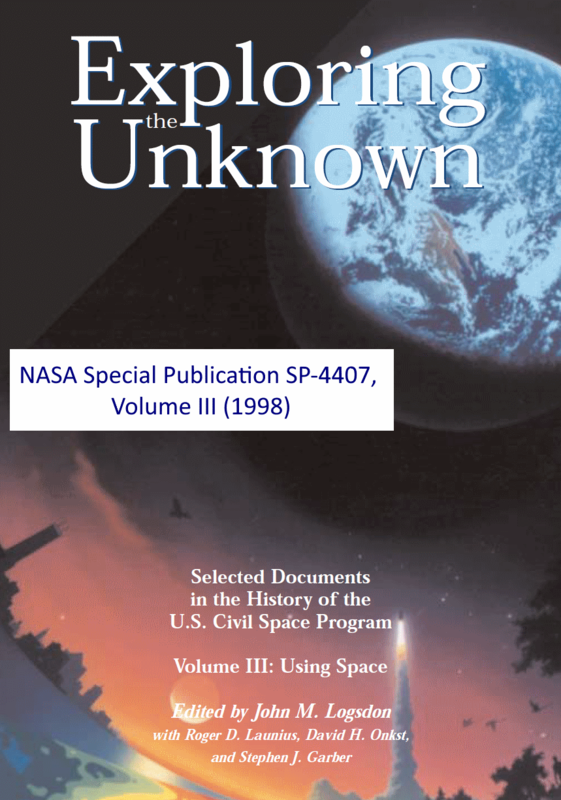 Later, the possibility was made more widely-known through various articles written in 1945 by Arthur C. Clarke, one of the doyens of space-related science fiction, who made 2001: A Space Odyssey with Stanley Kubrick just over fifty years ago. 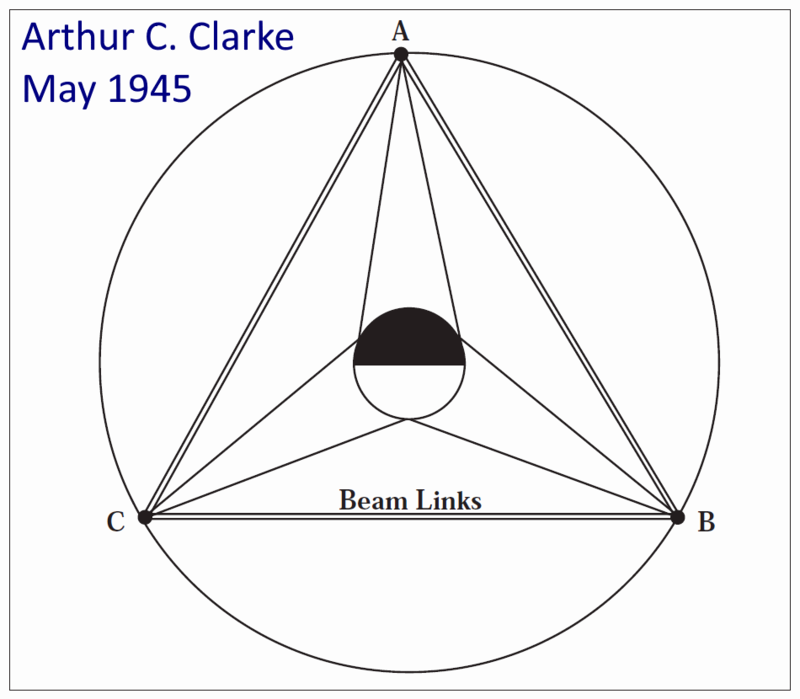 Because of his visionary suggestion in 1945 the geostationary altitude is sometimes termed the Clarke orbit, or the Clarke belt. Clarke’s first public mention of the idea seems to have been in a letter to the magazine Wireless World (now Electronics World) published in February 1945, in which he speculated on the possible usage in space exploration of the V2 rockets built by the Nazis during World War II. 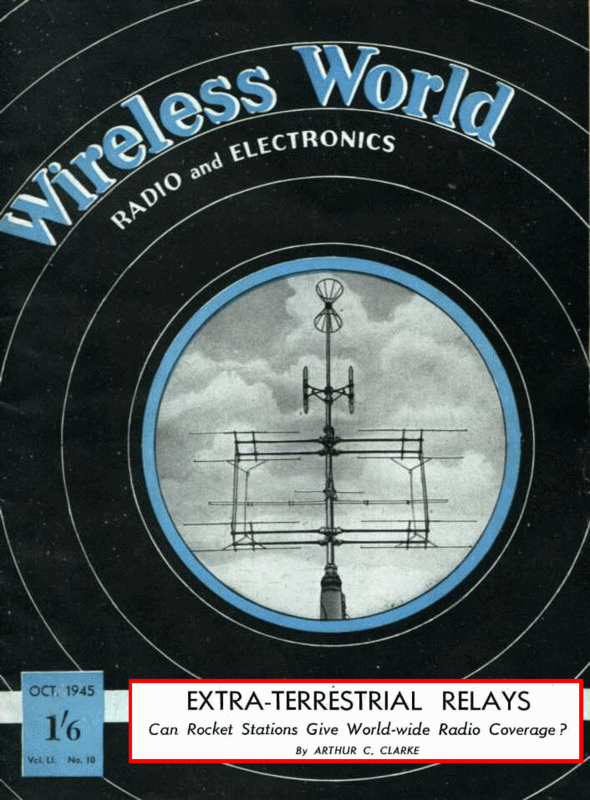 At that time the invention of the transistor and therefore modern electronics was yet to come, and so Clarke was thinking in terms of manned space stations at geostationary height acting as radio relay exchanges, recognising that just three of these could render rapid around-the-globe communications. You might note that Clarke did not get everything precisely correct: in my previous blog post I explained that a geosynchronous/geostationary orbit needs to have a period equal to the sidereal day, almost four minutes short of the mean solar day of 24 hours. By May of that year Clarke was circulating to a few correspondents a set of notes and sketches of what he had in mind, the diagram at right showing how much of the Earth each space station could cover, and the concept of radio links between them. This discussion was not published for another couple of decades; most conveniently it may now be found as pp.12-15 here. 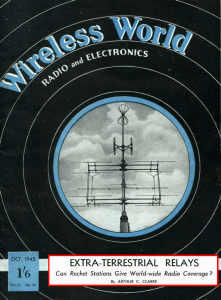 Over the following month or so Clarke developed his ideas more completely, and a fuller article appeared in the Wireless World issue of October 1945. 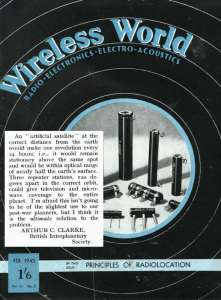 If you would like to see the original items by Clarke in Wireless World, scans are available here. The October 1945 article (written in June) is reprinted as pp.16-22 here. 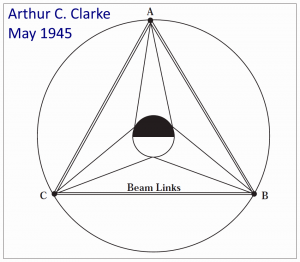 The importance of Clarke’s publications in 1945 is now widely recognised. 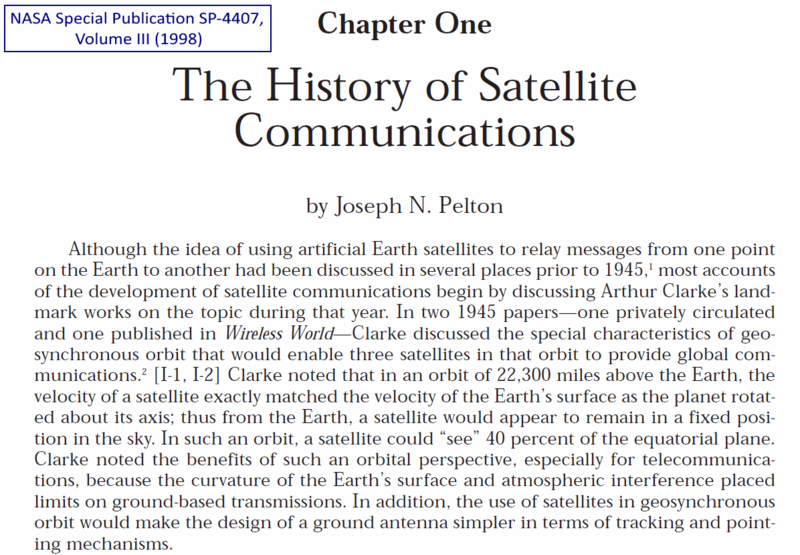 In NASA’s history of civil space programmes the chapter on Satellite Communications begins as shown below.